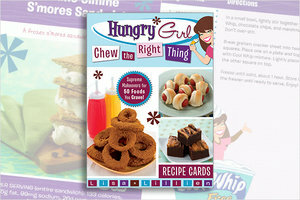 Hungry Girl's FIRST-EVER recipe card set! Now you can give in to temptation... 50 insanely delicious guilt-free recipe swaps in a super-fun card deck! From breakfast ideas and chopped salads to guilt-free junk food and cocktails, these Hungry Girl recipes taste fantastic but are low in calories. This card set makes an excellent gift for yourself or a friend!